Preview complete content residing in VHD and VHDX files. I was facing a serious issue with VHD file mount as I was in urgent need of accessing data which was failing every time I tried. Finally, I used this tool, and it is truly an amazing utility to view VHD/VHDX files. Kernel VHD/VHDX Viewer software truly is the best. I have used till date in my professional career of 20 years. Thank you for developing this outstanding tool and offering services without any hassle. 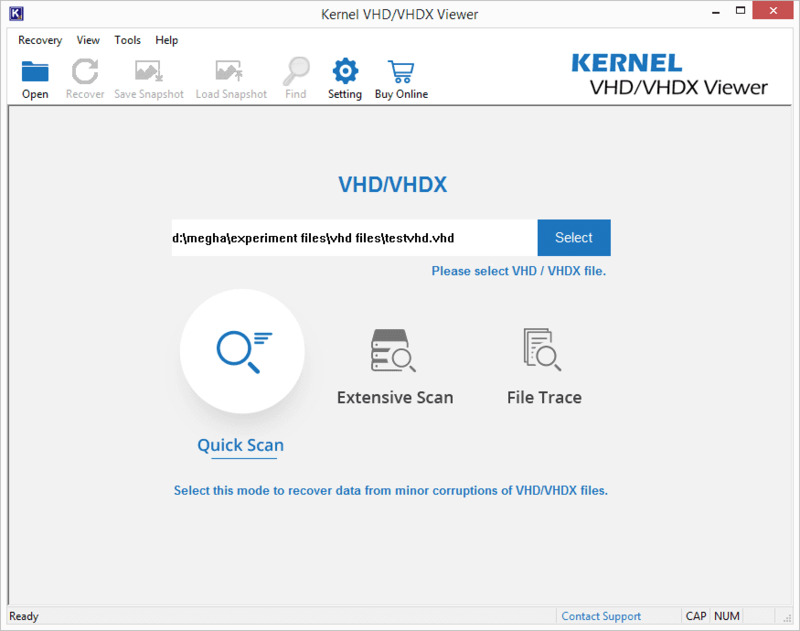 Free VHD Viewer tool helps you open and view the files and documents of even corrupt VHD/VHDX files including documents, media files, and database files. 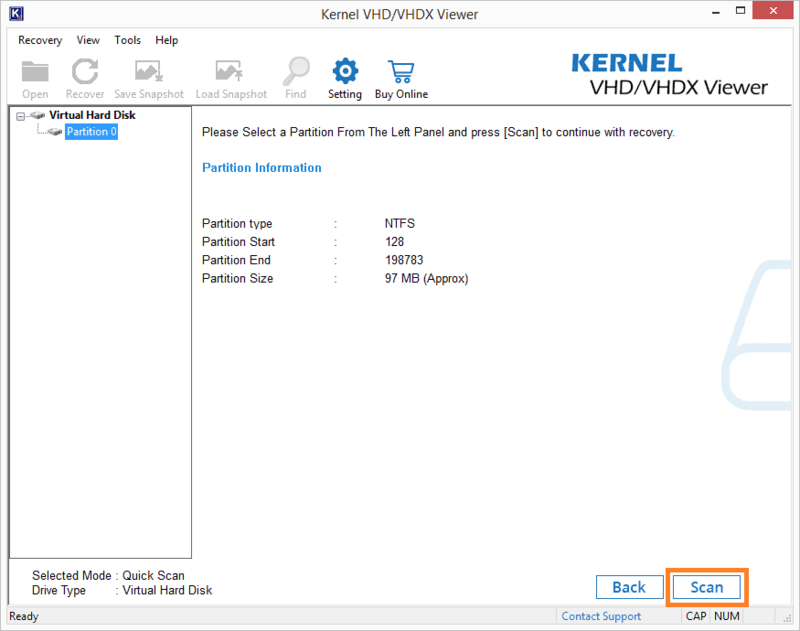 Kernel VHD/VHDX Viewer tool is designed with an easy and attractive Graphical User Interface. Novice, as well as trained users, can work with VHD Viewer tool efficiently. Free VHDX Viewer tool has 3 scanning modes. Quick Scan mode for normal scanning, Extensive Scan mode for minor corruptions and File Trace mode for scanning severely corrupted files. Users can view the desired file in the Preview pane simply by selecting it. You can view the files and documents as they are on a Windows machine. 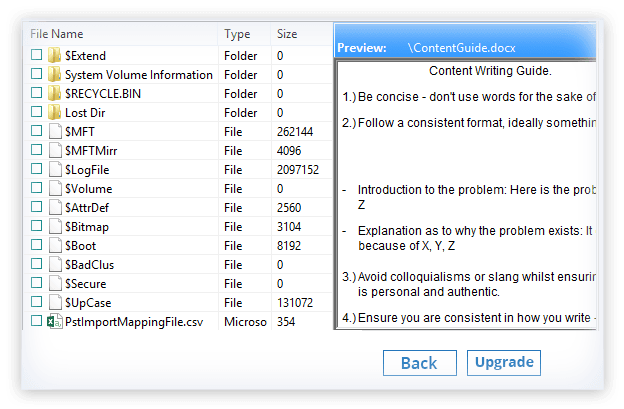 With the Find option of the software, users can search for files in the VHD files. VHD Viewer tool will find and display all the files that match the search criteria. You can preview these files after they are found. The tool supports all Windows Operating Systems including Windows 10, Windows 8.1, Windows Server 2016, 2012/R2, 2008/R2, and Windows Vista. 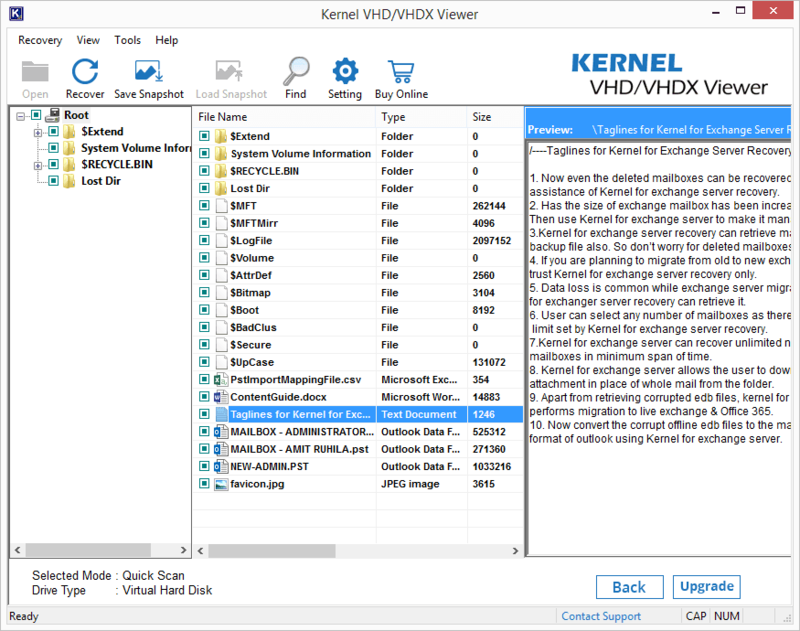 Free VHDX Viewer tool has full compatibility with Hyper-V Server too. 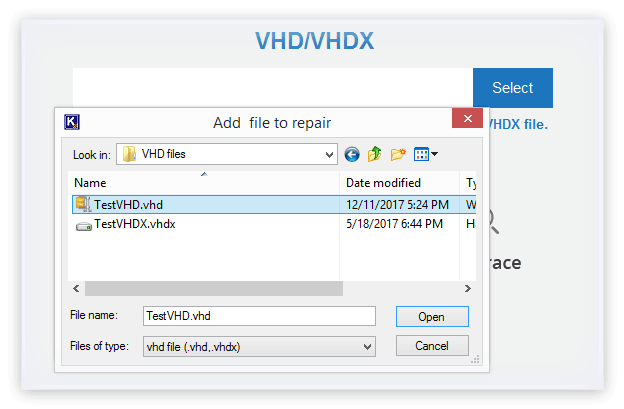 How can I view the contents of VHD/VHDX files? 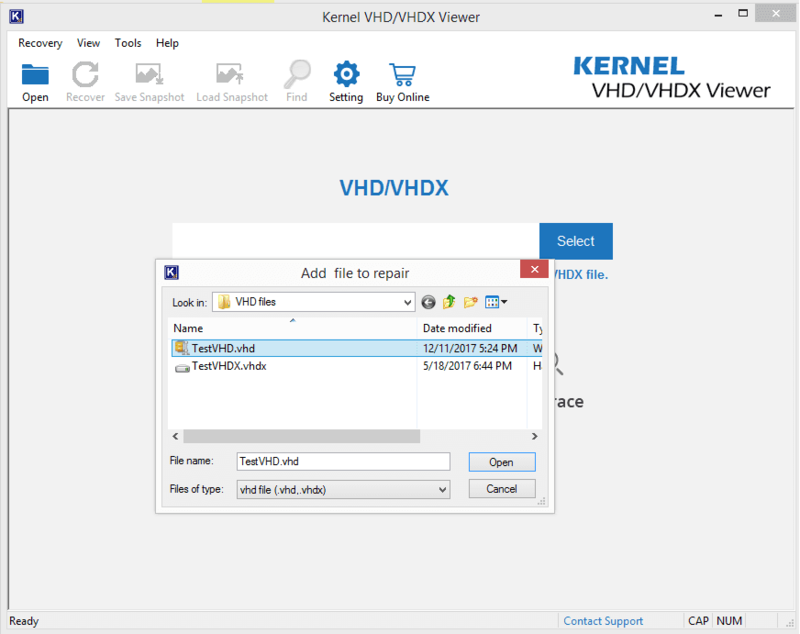 Launch Kernel VHD/VHDX Viewer tool. Select the specific Scan Mode. 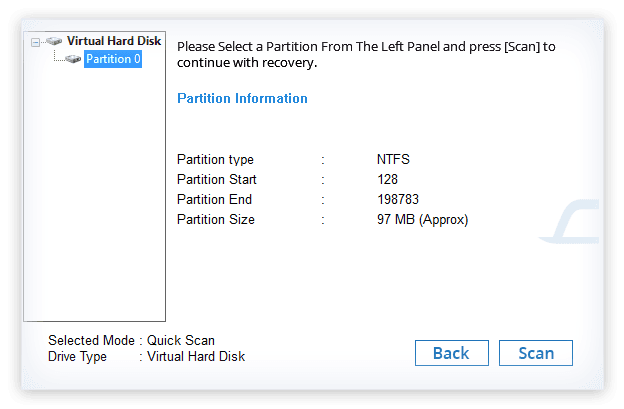 Select Partition and initiate the Scan process. Wait for Scan completion, Done. Does the Free Version of the tool allows saving VHD file data? No. But it opens both healthy as well as corrupted VHD and VHDX file data. 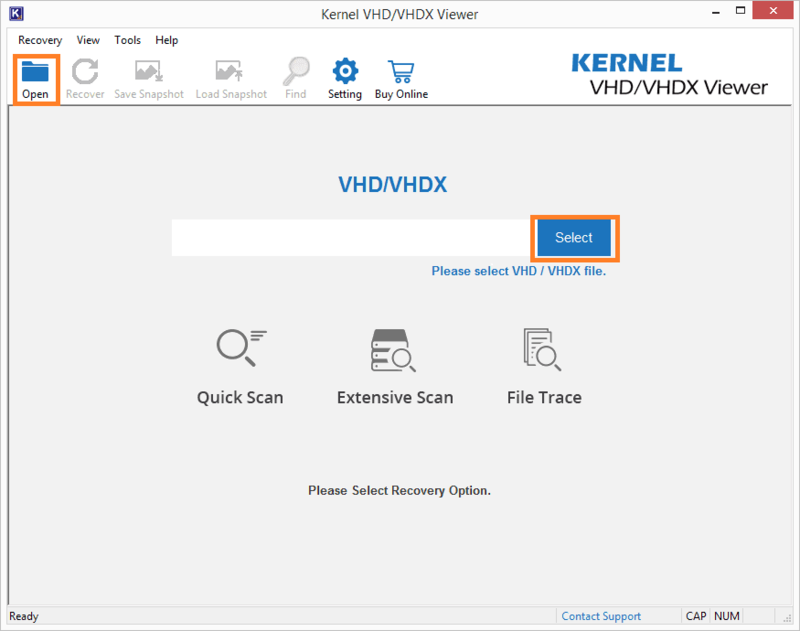 To save the data, purchasing Kernel VHD/VHDX Recovery software is recommended. Any filter option available in the software for searching for specific data? 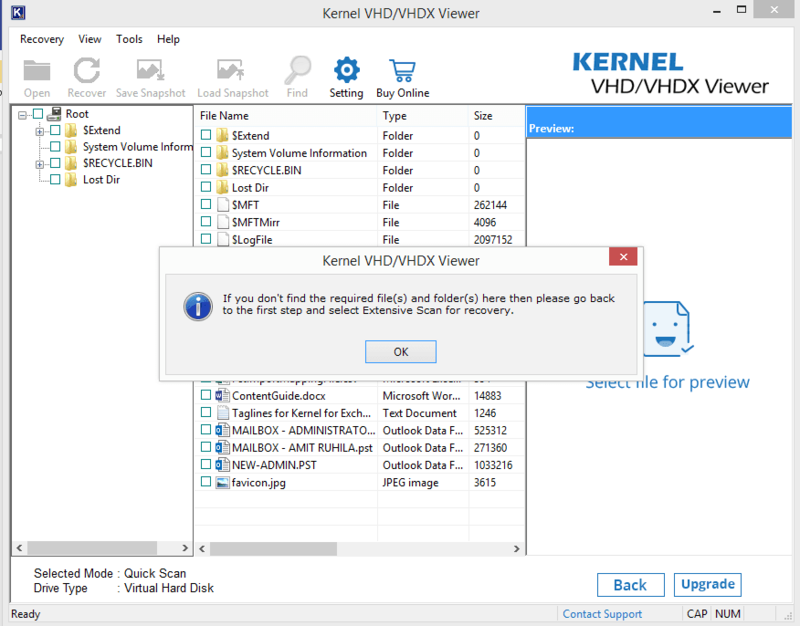 VHDX Viewer tool incorporates a Find option which searches to find the required files. It fetches all the files and documents and enlists them. I want to know if I could view the data in VHD files? Yes, for sure. This Free VHD Viewer tool fetches data within minimal time, and you can have a full preview of the entire VHD file content. How to use the three scanning modes available in this software? You are recommended to choose the Quick Scan mode at first. If all the items are not recovered using Quick Scan, then try scanning using the Extensive Scan mode. The third scanning mode File Trace is recommended if your file is highly corrupt and the two previous modes do not recover data. Displays data in VHD files created using Hyper-V Server, Windows Server 2012, Windows Server 2016 etc. 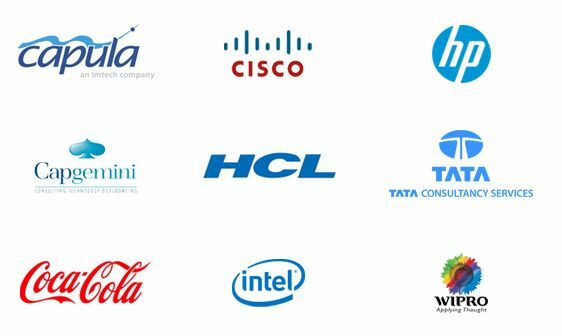 The software widely supports all environments of Windows OS. Hats off to the designers! "What an amazing support they people provide amazing team work and the quick and solution"
Best price for the same level of software from any other platform. Welcome screen of Kernel VHD/VHDX Viewer. Adding VHD/VHDX file to view. Selecting the mode for scanning the file. Scanning the partition for view. Previewing the selected VHDX file item.